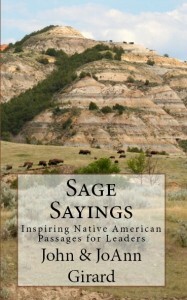 Our compilation, Sage Sayings: Inspiring Native American Passages for Leaders, includes about 500 of the most inspiring, thought provoking, and sagacious words we have ever read. A sample of about 200 of these are available on this site, but the entire collection is available in paperback or e-book format. Sage Sayings: Inspiring Native American Passages for Leaders is available at Amazon, Barnes & Noble, or your favorite local book store.